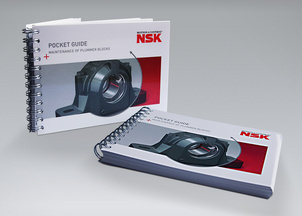 NSK has produced a handy pocket-sized guide for engineers, giving best practice maintenance information for the company’s SNN 500 and 600 series of plummer blocks. These units provide integrated bearing solutions – on shaft diameters from 20mm to 140mm – in demanding sectors such as general manufacturing, food processing, materials handling and agricultural. Providing ‘at a glance’ reference for all aspects of plummer block maintenance, the comprehensive new guide is designed for use by engineers in the workshop or in the field. The guide extends to 78 pages and includes sections on all aspects of bearing installation and maintenance. It makes extensive use of tables, graphics and labelled bearing images to cover such topics as typical bearing arrangements, mounting of double row spherical roller and self-aligning ball bearings, standard sealing arrangements, lubrication, interchangeability, and also technical data such as recommended speeds and tightening torques. Helpfully for the guide user, some of these sections are supported by step-by-step graphics illustrating best practice for the procedure concerned. The sealing section in the pocket guide is particularly comprehensive as the SNN series offers the user five options, depending upon the level of severity of a particular application and its operating requirements, typically speed. NSK’s SNN series of plumber blocks provides integrated benefits in general manufacturing industry, food processing, materials handling and agricultural applications. By providing units that are ready assembled to bolt into place, the SNN series enables designers to easily and economically solve specific bearing problems relating to component complexity, mounting, and also bearing maintenance and life in difficult environments.